The new book of Dr. Joseph Adrien Emmanuel Demes, “How to Improve the Quality of Your Life? 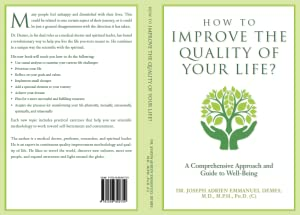 A Comprehensive Approach and Guide to Well-Being” is finally available on Amazon. This book is unique and will transform your life for the better. Trying to make lasting changes in your life can be a frustrating experience. This groundbreaking improvement book uses continuous quality improvement methods and values to help you create the life you want! Continuous Quality Improvement (CQI) methods have been used in the health-care system for decades. They are effective and efficient ways of implementing major changes and ensuring dramatic results. Dr. Joseph Adrien Emmanuel Demes has created an innovative guide that transfers the principles of CQI methodology from health care to personal development. The same methods that have allowed professionals to systematically assess success and improvement can be used to change all aspects of your life. Dr. Demes, in his dual roles as a medical doctor and spiritual leader, has found a revolutionary way to help you live the life you were meant to. He combines in a unique and comprehensive strategy the scientific with the spiritual. Dr. Demes believes in a holistic approach to improving everyone’s quality of life. Each new topic includes practical exercises that help you use scientific methodology to work toward self-betterment and contentment. The author is a medical doctor, professor, researcher, and spiritual leader. He is an expert in continuous quality improvement methodology and quality of life. He likes to travel the world, discover new cultures, meet new people, and expand awareness and light around the globe. Dr. Demes makes available to you a free tool to help you assess the quality of your life. Please use this method to evaluate where you are and where you want to go on your improvement journey.